Supreme Court 2015: Why don’t the justices let people hear their summaries? There is no crazier place than the Supreme Court plaza on the morning of a big decision day. 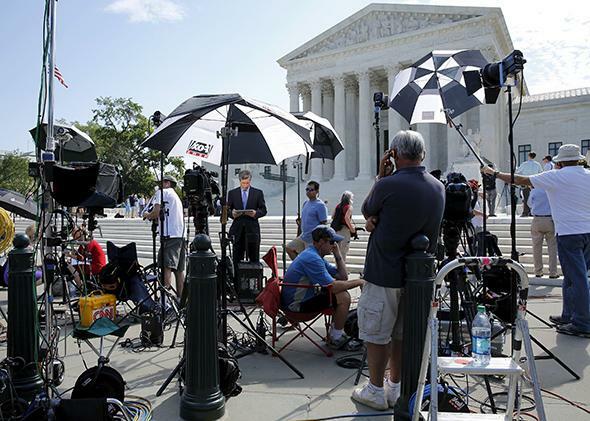 Television news crews wait for the Supreme Court to release decisions on June 22, 2015, in Washington. Good morning to all of you. As we prepare for Thursday morning’s decisions, I just want to reflect on what happens at the court on these big decision days. Because it’s every kind of crazy. And perfectly fixable. Release of opinion announcements is an especially prickly issue with the justices. The announcements are summaries written by the justice who wrote the majority, and the other justices in the majority don’t sign off on the wording. Current and former justices have said they are sometimes surprised to hear the announcement, which may overstate or oversimplify the holding in ways they don’t approve. As a result, some justices don’t want the opinion announcements to be featured in the news media as an accurate representation of court decisions. So this morning, I am killing time by working up this scenario that is half torts exam and half Greek tragedy, wherein an NBC intern is racing across the plaza at 10:05 a.m. ET. It’s slippery, because that plaza is waxy like a luge, on the vague architectural principle that justice is best served slippery. In my scenario, the intern trips, falls, breaks an ankle—oh, and also she hails from a state with no state-established insurance exchange, only a federal exchange. And, wait for it: When they prize the opinion from her hand, it’s King v. Burwell, the health care challenge. At which point, the court begins finally to allow audio coverage of opinions. All right, talk to you at 10:05, gentlemen. May the 2015 Running of the Interns proceed without incident. Read the previous entry, by Mark Joseph Stern | Read the next entry, by Walter Dellinger.